After weeks of expectation fueled by an exciting first of its kind worldwide digital media campaign (#musicinabottle), which had millions of young Nigerians engaged and interacting throughout the Social Media empire, STAR, Nigeria’s premium quality lager has unveiled its first ever limited edition of STAR MUSIC Bottle. The launch of the unique blue 60cl bottle held at the Marquee of the prestigious Federal Palace Hotel Victoria Island Lagos and attracted a select attendance from the business, entertainment and media industries. The exciting new bottle with a bright blue sleeve depicts exciting photos of the city landscape with a special QR code which when scanned, immediately takes the viewer through a delightful visual journey- a television commercial based on the limited edition bottle with superstars Wizkid and 2face Idibia. Other guests at the event included DJ Xclusive, Kelechi Amadi Obi, Yaw, Toke Makinwa, Ebuka Obi Uchendu, OC Ukeje, Kelvin Orifa, Toni Kan, Bez, Tunde Ednut, Uru Eke, Beverly Naya, Henry Ekechukwu and many more. The limited edition of STAR MUSIC Bottle is available to consumers from 1st November to 31st December 2013 at selected outlets across the country. 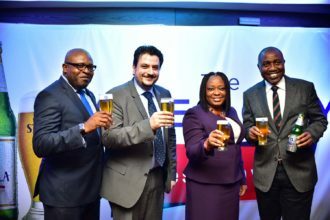 International Premium Stella Lager Beer Launches in Nigerian Market.